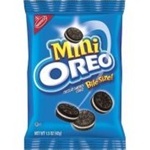 Oreos and other cookies in small packs are some of the best selling vending items in the world. Patrons love a good bag of cookies at school, in waiting rooms and at ballgames. Campbell's Pepperidge Farm 100 Calorie Chessmen Cookies 0.71 Oz. Nabisco Chips Ahoy Minature Snack Single Serve - 1 Oz. Nabisco Nilla Vanilla Waffer Cookies - 1 Oz. Keebler Sandies Shortbread Mini Cookies - 1 oz.